James K. Polk Presidential $1 Coin Covers will be available Thursday, Oct. 1 at 12:00 noon (ET), the United States Mint announced in a press statement Monday. These 40,000 limited edition covers include two James K. Polk Presidential dollars that were struck on the first day of minting. One dollar is from the Mint’s Denver facility and was produced on June 15, 2009. The other is from Philadelphia and was minted on June 1, 2009. The Presidential $1 coin covers are priced at $14.95, plus $4.95 for standard shipping and handling. No household order limits are in place. In addition to the two $1 coins, the display card includes a 44-cent Flag postage stamp with a postmark of August 20, 2009, Columbia, TN, which is when Polk Presidential coins were released into circulation. Designed by Susan Gamble and sculpted by Charles Vickers, the obverse (heads side) of the coin features a portrait of Polk with the inscriptions "James K. Polk", "11th President", "In God We Trust" and "1845 -1849." 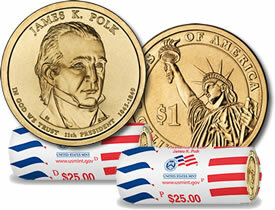 The James K. Polk dollar is the 11th coin released in the series honoring U.S. Presidents. It is the third for 2009 after the John Tyler $1 coin launch on May 21. The final 2009 Presidential Dollar will be released later this year featuring former President Zachary Taylor. The first four Presidential Dollars issued in 2007 had the image of George Washington, John Adams, Thomas Jefferson and James Madison. The next four $1 coins released in 2008 honored James Monroe, John Quincy Adams, Andrew Jackson and Martin Van Buren. The covers may also be purchased through the Mint’s toll-free number, 1-800-USA-MINT (872-6468). Hearing- and speech-impaired customers may order by calling 1-888-321-MINT (6468). I was given a James Polk coin as change. This the first time I saw it and was wondering if it worth more than $1.00? I have one too,is this worth anything.